As with Hurricane Katrina in New Orleans, the damage caused by Hurricane Sandy to New York City is only beginning to come clear in the aftermath. My neighborhood – Jackson Heights, Queens – was spared almost completely by the storm. We’re currently living in a weird state of normal, unable to travel out of the neighborhood because the city’s subway system is still totally inoperative. Meanwhile, I’m hearing from friends who live in downtown Manhattan and New Jersey: they are without power, water, and cellphone service. So far things have been quiet, but who knows what is to come. My home campus on Staten Island is shut down and without power for at least a week. Friends who live on Staten Island are telling me that people are looking for folks who were washed out to sea. What seems incomprehensible is the lack of official preparation for this storm. Okay, people were warned to leave their homes if they lived in evacuation zones. As with Katrina, many didn’t or couldn’t leave and are now coping with flooded houses, no power, and, in some cases, far worse. But looming over these personal tragedies – and intensifying them immeasurably – is the destruction to the city. Who knows how long it will be before the city’s transportation infrastructure is back up and running. How long will it be before power is restored to some of the key parts of the city? And what kinds of toxins have been deposited in areas like the subway system, none too clean to start with, where we soon be asked to walk/sit/breathe? 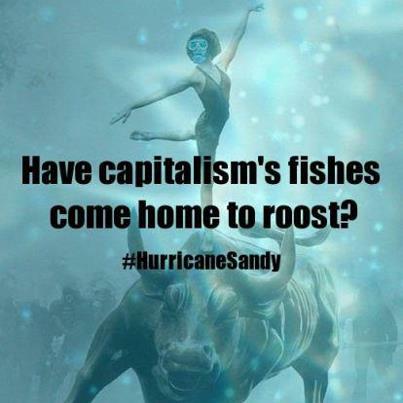 How is it possible that adequate preparations were not made for a storm such as Sandy? Three years ago I went to see an exhibition at MOMA called Rising Currents that focused on a series of architectural project intended to deal with the impact of rising sea levels on parts of New York City. So these issues have been in the air. It’s not as if no one knew that climate change was happening. So there’s been a total failure of leadership and forethought. Perhaps this is because elected leaders are simply interested in short term servicing of capitalism’s short term need to make hyper-profits. 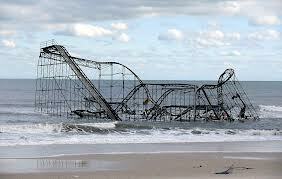 But surely the system has been dealt a grievous economic blow by Hurricane Sandy. In the coming days and weeks, it will be key to intervene in every possible way in the political spin put on this disaster. Now is the time to renew the basic messages of the Climate Justice Movement about the need for a just transition to sustainable green technologies and social justice. I’ve been summoned for jury duty in New York. Happens every six years. Although it eats up precious time, it’s an amazing opportunity to rub shoulders with New Yorkers from totally different walks of life, and also to catch a glimpse of the wheels of formal governance as they turn. The assembly room was in a fairly anonymous office building downtown. I sat down in one of the only available chairs, next to a guy dressed head to toe in fatigues with a tissue stuffed up one of his nostrils and a cap pulled down over his eyes. He didn’t seem to be feeling the civic love. Shortly after I arrived, a court clerk picked up a microphone and began playing M.C., explaining that we were in the “civil term” of New York Supreme Court lawsuits. No criminal cases, in other words. The opening ceremonies really began, however, with a film that kicked off with a man being drowned in a medieval European trial by ordeal. The film then went on to trace a linear narrative of progress up from such barbarism in which the jury figured ever more centrally in the dispensation of justice and the maintenance of democracy, from Charlemagne’s blatantly biased jurare to the Zenger trial in colonial America that established jury independence to the admission of women to juries following World War II. The film interestingly also focused on the trial as a performative site, with various dramatis personae and other elements of dramatic structure such as conflict and resolution. The rousing conclusion of the film suggested that jury service is our “opportunity to seize power,” which begged the question of why we are only entitled to power every six years. During my first day, jurors were called for three different trials. I was ineligible for the first two since I work for the city of New York, which was being sued by someone in the cases under consideration. The third trial, for which I was picked along with around thirty other people, involved a lawsuit over asbestos poisoning (more details at https://mesotheliomaexplained.com/mesothelioma-lawyers/). This would have been very interesting to be involved with, but we were warned that it would take approximately four weeks. At that point, everyone except six people in the jury pool begged off. So it seems that in really complex cases only people who are unemployed, retired, or otherwise unoccupied are really able to mete out justice. This rather undermines the claims about the representative character of juries that were so carefully set out in the film screened during our introductory ceremonies.